Has anyone replaced the original panels on the hardtop with new same or similar sized ones? I would like to boost power output with the same footprint. Standard sizes have changed. Additionally, I'm sure the original controller was PM rather than MPPT and thus is obsolete. This field has move far in the past decade. You probably just need to start over. Not a big deal. I consider the specific equipment I installed ~ 8 years ago obsolete in terms of recommending anything, so I won't. I still like the mounting, though. Very simple and very strong. Thank you . Will continue onward thru the fog !! I've been researching this as well, as part of a scheme to do a solar upgrade this fall which will include adding a couple 150 watt panels over the hardtop and a couple 100s mounted over the stern. My preference would be to mount the new panels in the existing starboard mounting frames so I'm approaching it from that perspective. 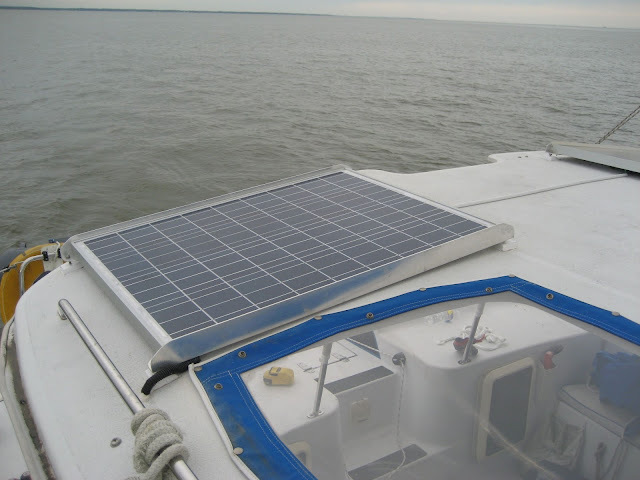 I have not found any new panels which are the same size of the original Siemens 50watt panels that came with the boat. They measure 23.5 x 31. A combination of a couple of these 70 watt panels (21.65 x 32.68, $130) https://www.amazon.com/Watts-Solar-Pane ... NNEL+solar; with one of these 50 watt jobs (21.3 x 24.8 ($72.19) https://www.amazon.com/Renogy-Watts-Vol ... anel&psc=1 which measures 21.3 x 24.8 ($72.19). The combination would give you 190 watts (versus the 150 watts from the Siemens trio) about for $335, or $1.76 per watt. These panels are narrower that the stock Seimens by a couple inches, so you'd need some spacers, or to move one of the starboard mounts in a bit. But they should fit lengthwise, 90.2" versus the stock 91". I also found some 30W panels which measure 23.8" x 13.5 @ $47 each. https://www.amazon.com/Mighty-Max-Batte ... ar+30+watt. You could mount 6 of them in the current frame, though you'd have to move one of the frames out by about 1/3 inch. That would give you 180 watts at $1.56 per watt. Finally, these 30 watt flexible panels are advertised as measuring 20.5" x 13" and sell for $45.21 https://www.amazon.com/Feileng-Maintain ... ar+30+watt. You could fit 7 of them in the current frame for a total of 210 watts. ($1.51 per watt). You'd need to build frames for the panels to mount them on, however. I cannot speak as to the quality or reliability of these panels. Let us know if you find something with a better fit. Last edited by Iriemon on Tue Aug 28, 2018 1:19 pm, edited 1 time in total. I've done well with Renology panels. Over 8 years and still going. I've also done well with semi-flexible panels from Chinese sources. I was planning to permanently install a bunch of these, but ended up selling the boat. However, one of them lives on with my F-24 and I am very happy with it. The key is to remember that these use the SAME cells without the glass to protect them. They must be well mounted and not walked on. That said, they are easy to mount and very light. I would NOT but them on canvas, only on solid surfaces. The advertising about bininis is largely BS from an engineering perspective. I have read that panels should not be mounted flat onto a surface, so they can dissipate heat for better efficiency. It wouldn't be an issue with rigid panels (i.e. those that come with an aluminum frame with edges to keep the panel off the surface). But I have no idea what efficiency affect, if any, mounting them flat on a surface would have. Probably more of an issue, if at all, in the tropics. * Mine is mounted on a 1/8" thick slider turtle, so little different than mounting on canvas. NOT a PDQ solution, but it was a part of my reasoning. * Many slip a layer of something corrugated under them to allow for breathing. This could also be done with thin strips of prelaminated FRP for just a few $$. This latter is what I did on the PDQ. Bond the strips to the panel and then screw the panel down. In fact, I used Velcro on the PDQ (3M Dual Lock). In fact, just bonding them with strips of Dual Lock will give considerable ventilation. This stuff is like Velcro-Zilla. It snaps in place. On the other hand, many respected manufacturers don't see it that way. Direct bonding is common practice. Has anyone figured out a. solution to the size matching problem that iriemon mentions? On the later PDQ 36s, there are 3 "wells" on the Bimini top where the 3 panels drop in, and there is almost no room for error. The new ones really couldn't be much larger (maybe 1/2" on each side at most) than the old ones. Of course, they could be smaller, but that sort of defeats the purpose of replacing the old panels with newer, more efficient ones. Just returned to the Boat so I can do some hands on measurements. It looks to me like 7 of the 30 watt Mighty Max panels will “just” fit lengthwise 94 1/2” for 210 watts no reviews on that particular size but the brand seems to have decent reviews ? A belated Thank You to those who responded, thanks for sharing your time and Knowledge. just found the review you must have been writing about.. back to the drawing board . So no on the Mighty Max panels. Renology and HQST have recently come out with a "compact" 100 watt mono solar panel for ~$110 each. (I think they are the same panel for both) The panels are spec'd at 42.3 x 19.5 x 1.2 inches. A couple which will easily fit within the existing frame, with room to spare. These Dokia 100w panels are 46.2 x 20.8 for $95 and would just fit lengthwise in the existing starboard frames. These 100w Eco-worthy panels are $106 and 39.8 x 20.1 x 1.4. No frame, but you could make one easy enough with something like these aluminum angled bars: https://www.homedepot.com/p/Everbilt-1- ... /204325583. No reviews on them yet, so they are in the "take a chance" or "wait and see" column. Last edited by Iriemon on Fri Dec 07, 2018 10:31 am, edited 2 times in total. These Renology 30 watt panels are the same size as the "Mighty Max" 23.8 x 13.5 and from a more reputable seller. Bit more pricy, however, at $53.29 each. I am planning to replace my panels in the spring. I have found that I can get a reasonable fit using three 100 watt panels with the center panel mounted at right angles to the ones on either side. I will cut the starboard mounting strips to allow the center right angle mount. The configuration will still leave adequate space for standing when stowing the mainsail. When at anchor I normally move the boom to one side for best solar gain. 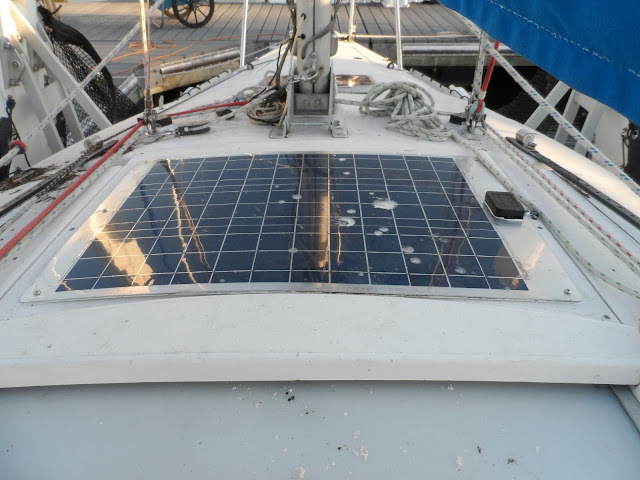 I ended going with 2- 100 watt solarworld panels from E -marine I could have fit a smaller size 20 watt in the middle but it would have pushed the ends of the 100s outside of the existing frame and it required shimming for it to fit and I didn’t feel it was worth the hassle . Thanks to all.Hope panel size comes down over time would love to fit 300 watts in existing footprint .